Bees are virtuous because they are much loved by all, and sought after with great longing by everyone, because their honey tastes as sweet in the mouths of paupers as in the mouths of kings. I have this weird thing about bees. I'm a bit phobic about most insects, but bumblebees are just so dopey and sweet (and, of course, incredibly important pollinators) that I can't seem to get too worked up about them. They also play a significant role in one of my favorite books, Palimpsest (which is quoted above), which is why I got my bee tattoo for my 30th birthday. I'm sure I don't have to explain why this dress put me in mind of bumblebees - the bold yellow and black color palette pretty much speaks for itself. And since I love a theme, I really ran with this one. 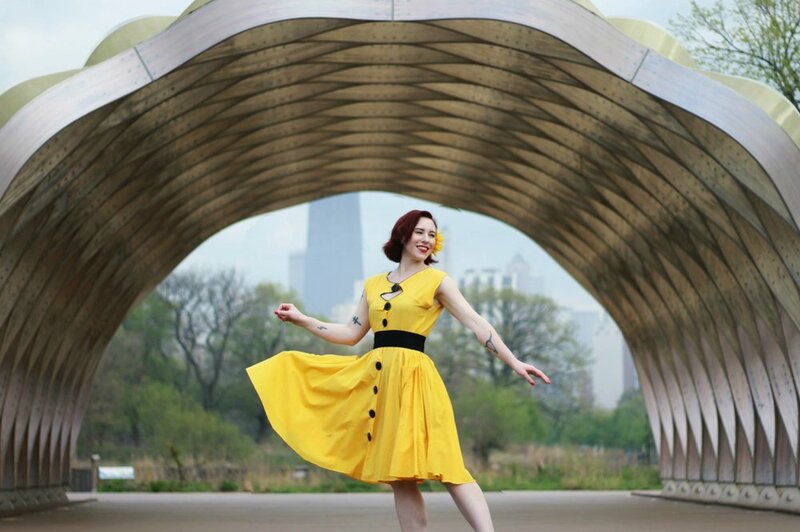 Yellow and black dress, bee tattoo, shoes with bee embellishments, and featuring the fantastic honeycomb structure in Lincoln Park. Short of covering myself in actual bees, I don't think I could have gotten much more apian with this.